How many mortars do you have? While I was working on Yashim Cooks Istanbul, I added another two to my kitchen collection, one stone, one made of olive wood. Various recipes in the book call for spices, nuts or even pulses to be beaten, chopped, crushed or pounded. Most cookbooks suggest giving your ingredients a quick spin in a food processor, but I fight shy. I can’t stand the noise, for one thing, or those rubber feet, or the clutter that a food processor brings into the kitchen. These machines have a horrid arsenal of blades and graters, rendering every drawer a danger to unwary fingers. They make me jump – and who wants to be jumpy in the kitchen? Pestle and mortar, on the other hand, work just as they did when these dishes were first prepared, centuries ago in the kitchens at Topkapi Palace. They were there, in the shape of two stones, when cookery was invented: after fire, and a pot, perhaps even before decent knives, cooking must have involved crushing. Old stone querns, for grinding grain, belonged to the ancients and have entered myth. 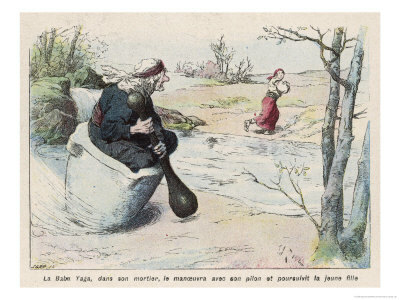 Baba Yaga, the Russian witch, flies about in a pestle and mortar. They are an elemental pairing – yin and yang: pestle is, of course, cognate with pizzle, which it basically resembles. That, I think, is cheerfully salacious. Not that I am driven by myth and Luddism. Or not entirely. Yashim Cooks Istanbul isn’t an exercise in historical re-enactment, like making mediaeval rice of flesh in an iron bowl, or chucking up lark’s tongues in the vomitorium. The recipes in the book are simple, inspired by their Ottoman originals but not slavish. They are dishes I’d cook at home, any day of the week, as Yashim does in his Balat flat. 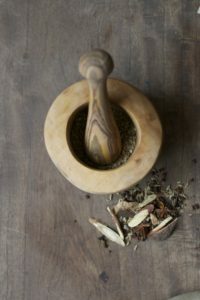 No – the advantages of the pestle and mortar are as practical as elemental, even if they aren’t all visible. What you do see, for starters, is the beauty of the tools, in the grain of the wood or the clean, clear lines of the stoneware. It’s that simple, a tool for the hand and another for the bench. In my kitchen, the mother of them all is the 12 gallon mortar in which, incredibly, you can crush the tiniest pinch of cumin with the merest roll of your weighty pestle. You probably know that a proper pesto is always made in a mortar – just as basil is always torn, not chopped, for adding to a dish. Whirr a pesto in a food processor and you have a glaucous minced mess, whose oily perfume has been already dissipated by the whizzing blades. Beating the leaves, garlic and pine nuts in a mortar takes a little longer (though washing out processor jugs and bowls is another chore), but the whole thing breaks down the oils, and keeps the pesto cool as it should be. The same thing applies to spices – or to chickpeas. The reviewer at Country Life Magazine called Yashim’s hummus ‘the best ever’, perhaps because I suggest using a pestle and mortar to reduce the chickpeas and garlic to a thick, uneven, consistency rather than the whirred-up paste you get from a plastic pot. 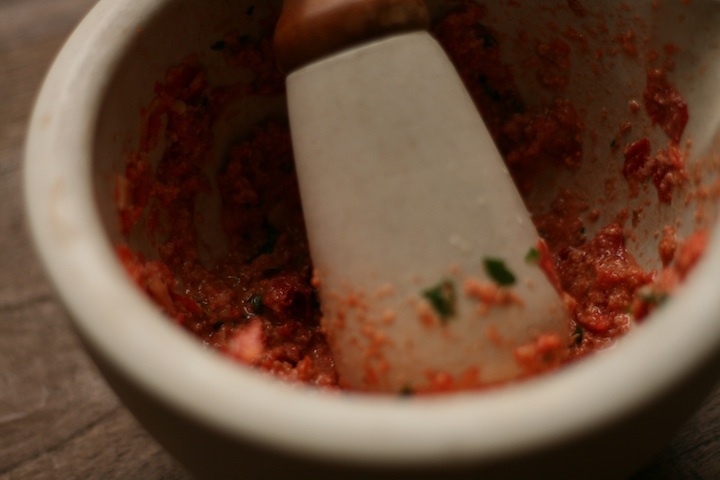 There’s no way to grind spices better than a mortar, either; or to crush herbs. It’s about avoiding stress, not inducing it – nor inflicting it on your ingredients. Pound away. It’s good exercise, and a therapy. Wonderful aromas rise like soothing balm, the action is physical but not exhausting, the sound is regular and human. It is the sound of somebody chopping wood down in the valley. It is as satisfactory as ringing a gong; and it makes you happy. 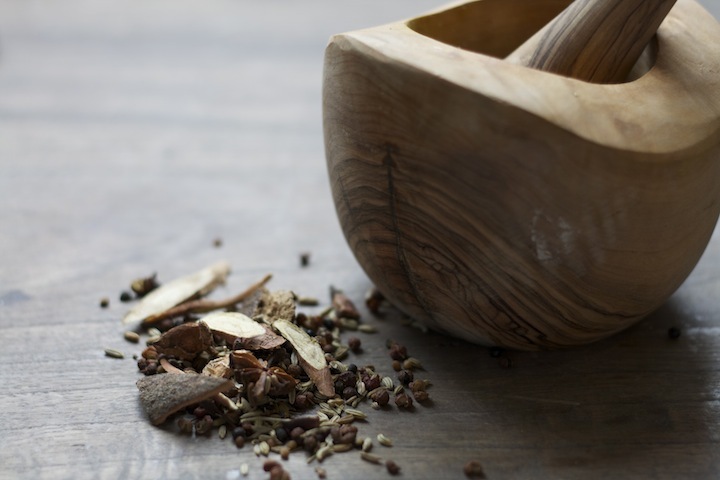 The pestle and mortar’s closest relations are the wooden chopping board and the sharp steel knife. 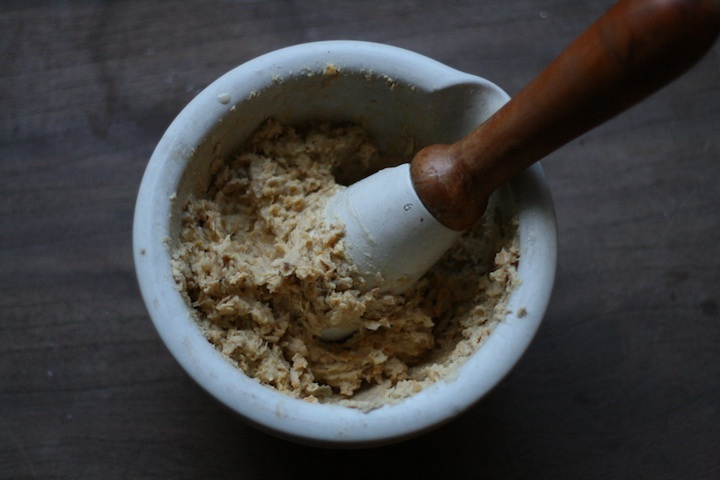 A family resemblance also exists between a pestle and a rolling pin, as between the mortar and a pot. These are what cooking is about. These are the implements it requires. And not much else. When, in An Evil Eye, Yashim observes that cooking is really about a sharp knife, he’s pleased to be given one forged of Damascus steel. With the blade he can flatten, crush, chop and slice anything. But when he wants to make muhammara or hummus, or grind spices or nuts for baklava – or roasted coffee beans – he turns to the pestle and mortar. His is a marble mortar, and the pestle has a handle of cherrywood or ash, attached to a marble bulb, whose significant weight does half his work. It is primitive. But then living in Istanbul in the first half of the nineteenth century, Yashim knows nothing of the magimix. This entry was posted on January 10, 2017 by admin.